The Black Tai originated from Vietnam, Laos, and China. They are known as "the people without a country." As a result, they became refugees in Thailand and then migrated to North America, specifically to the state of Iowa. Their name originates from the traditional black skirts and headdresses worn by Black Tai women. The black silk is embroidered with flowers and beautiful patterns. The belt is typically bright green. 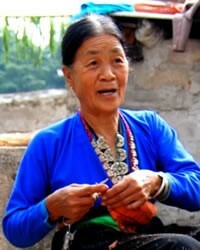 Black Tai women wear the traditional clothing at ceremonies. Traditional Black Tai religion consists of spirit worship, and the spirits of ancestors are especially important. They wear white at funerals as a symbol of grief. After the funeral but before the cremation, coins are thrown into the crowd. The dead are cremated with gold and silver jewelry. This practice originates from the belief that the person's dead spirit may need to produce payment into the spirit realm. Iowa is considered home of the Black Tai for the free world. Though their migration to the United States was 40 years ago, many still speak their mother tongue, Tai Dam, and the majority continue to adhere to their cultural traditions and festivals. Pray God will work through the few evangelical Black Tai to reach other Black Tai for Christ. Pray God to send Christians to serve and discover people of peace among Black Tai people.